I received a 40% off coupon in the mail for H&M and ya'll know I'm a sucker for coupons, so of course I had to use it! I must admit though, I had to look long and hard before I found anything I wanted to use it on. I finally found this cute palm print skirt, and after the coupon was deducted it cost only $14.99! My favorite piece to wear in the hot summer months is a short skirt. I don't know at what age I'll ever be able to give them up. I just love the comfort, and I think short skirts look better on my frame than midi skirts. What sold me on this skirt was the beautiful neutral palm print and the built-in elastic belt. It is extremely comfortable, and the material is very light weight and didn't wrinkle when I wore it! 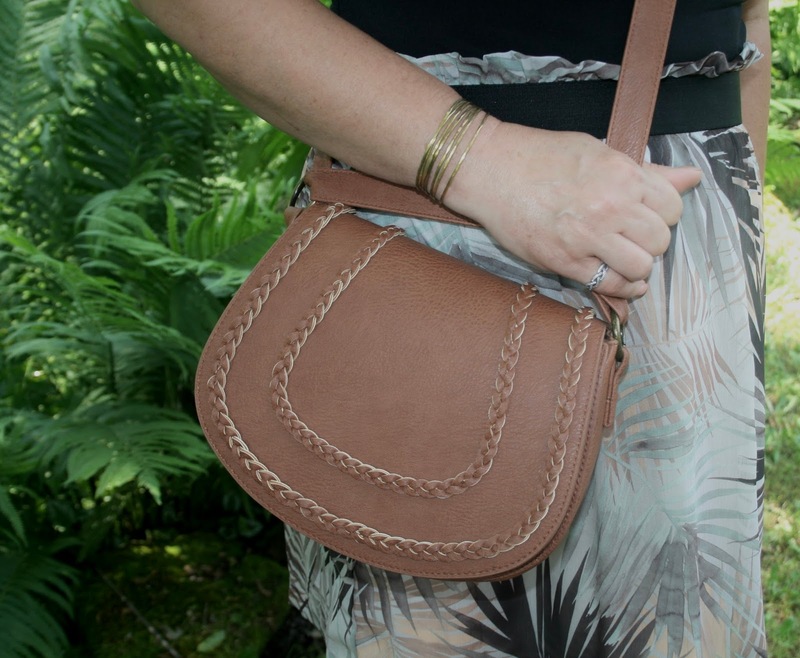 I carried a brown saddle bag that my daughter gave me to accent the brown tones in the skirt. I wore a gold bracelet on my wrist and a black and gold necklace around my neck. I chose black wedge sandals that I picked up on clearance at JCP a few years ago. I paired my skirt with a simple black Worthington Tee Shirt from JCPenney. It was a very hot weekend, in the nineties , and I wore this outfit to church and out to lunch. The nice thing about elastic waist skirts is you can pull them up or down for whatever length you desire. I chose to wear my skirt higher up on my waist to camouflage my tummy and accentuate the smallest part of my waist. But if you don't have tummy issues, and you are more concerned about your legs, you can wear the skirt lower on your hips. You look fantastic in this skirt and the print is just darling Amy! Awww, thanks so much Brooke! I LOVE H&M, but sometimes it is hit and miss for me! This palm skirt is def. adorable and so perfect for this summer! I always love to have some fun summer pieces in my wardrobe. Yes, I was surprised I had such a hard time finding anything. I never had that issue before. Thank you! Amy you chose the perfect piece from H&M! I had that 40% off coupon with free shipping too but I let it expire because I couldn't find anything, I was nervous about the fit. This skirt is adorable on you! Thanks for linking up with Fabulous Friday! Thanks so much! That's the nice thing about elastic waist skirts, you don't have to worry too much about the fit. I'm glad I'm not the only one that had trouble finding anything. Love palm prints for summer! And H&M always has the cutest pieces! Cute look! Love the length of the skirt. And what a fun print, perfect for summer! Thanks Elli! I'm sure this skirt will be getting a lot of wear! I love this palm print skirt! the muted color are so pretty, and that print is perfect for summer. Thanks Rachael, the muted colors are what sold me on this skirt! I love those 40% off coupons from H&M! I love the skirt you bought. You dressed it up beautifully! Thanks Nancy! That was the first coupon I ever got from H&M! It was a nice surprise in the mail! 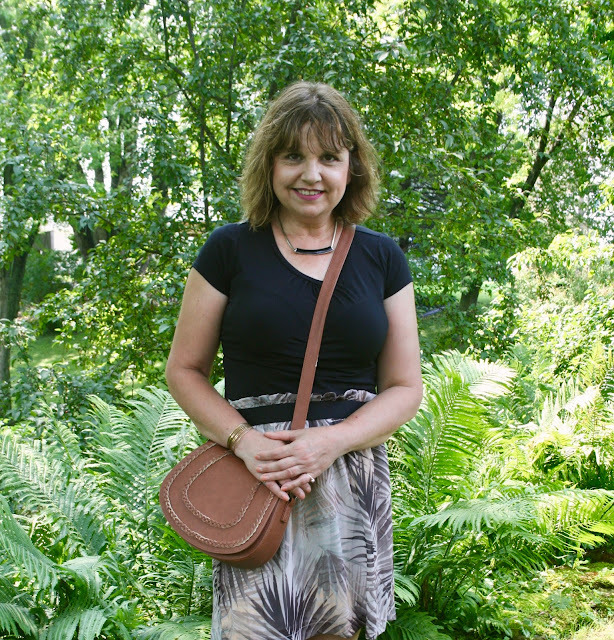 Love how you've styled this great skirt, Amy! Very chic look! Okay I love H&M and I love this skirt! The palm print is adorable and the shape look perfect on you! I'm a sucker for a coupon too...and what a great deal, Amy!! I love my short skirts too, and hopefully that will never change! Oh, that's so good to hear Jodie! Thanks so much! It was fun to have you co-host! My computer is playing games with my head. I can't find my comments once I've published them so if this is a double, my apologies. I was just saying how much I like this outfit. Initially, I'm drawn to your necklace and handbag - so cute - and then to the overall look. This is such a great summer outfit! Thank you for linking up to the Thursday Moda! What a treat it is to chat with so many ladies. No, your computer isn't playing games with you. I have a comment moderation enabled on my blog. If I didn't, I wouldn't get notification of when someone comments, plus it keeps all the spammers away! Wow. This skirt is so chic! You look so cute! I love this look on you! It's so you! You know want looks best on you! Thanks for linking up to Top of the World Style. I love your palm print skirt! This is such a chic summer look!